What role does Neanderthal DNA play in our genetic makeup? How did the theory of eugenics embraced by Nazi Germany first develop? How is trust passed down in Africa, and silence inherited in Tasmania? How are private companies like Ancestry.com uncovering, preserving and potentially editing the past? 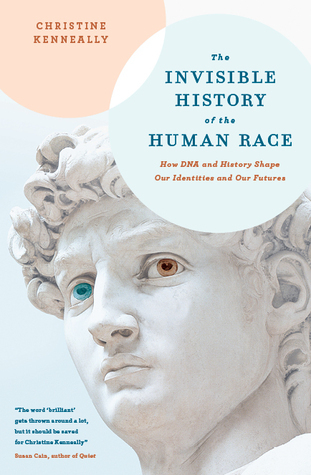 In The Invisible History of the Human Race, Christine Kenneally reveals that, remarkably, it is not only our biological history that is coded in our DNA, but also our social history. She breaks down myths of determinism and draws on cutting-edge research to explore how both historical artefacts and our DNA tell us where we have come from and where we may be going. This is the second book in my read-through of the Stella Prize 2015 shortlist nominations. If you want to learn more about them, please click here. My experience with non-fiction is limited to textbooks, and other things I’ve been forced to read over the years for class. I don’t hate non-fiction, but I don’t love it either. I think I’m more of a literary based non-fiction reader, so biographies of authors, or literary criticism – that sort of thing. I just wanted to mention this because I think this book is probably really good, but it’s just not my sort of thing. I wish I could say I was still interested in science, but honestly I think I left that behind at high school. I’m sure a lot of people would really enjoy this, and I did personally like sections. I really loved the first part of the book that looked at genealogy in Western society and elsewhere. The chapter about genealogy in Nazi Germany was particularly interesting. But sometimes, the science behind it all just got a little too much for me. I think the writing style was great too. I loved how personal it was and I definitely laughed a few times which I wasn’t really expecting. Even though I have a very basic knowledge of most of the things covered in this book and even though I wasn’t passionate about any of it, the writing was so engaging that I kept reading long after where I would have usually given up. Basically, this is a great book, just not my kind of book.